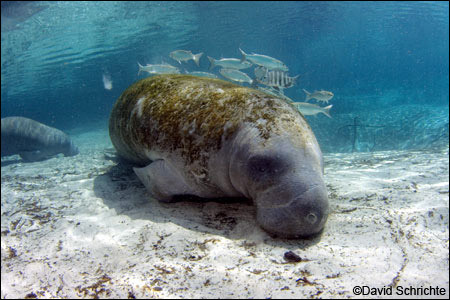 It’s more accurate to say that manatees rest, for up to 12 hours/day. Animals like marine mammals exhibit unihemispheric sleep because they have to come to the surface to breathe. You can’t truly sleep underwater when you need to breathe air. This means that half their brain gets to rest while the other half remains alert. Humans, on the other hand, sleep bihemispherically. Only a couple of studies have been done due to the invasive nature of the required procedure and the impropriety of conducting such tests on protected species. But it does make sense that manatees would exhibit unihemispheric sleep since they need to come to the surface every 20 minutes, requiring motor function and a wakeful state to do so. Read How Do Marine Mammals Sleep In The Oceans? at Biosphere Magazine.